There is a point on Kangaroo Island from where you can gaze at the end of the world. Only a local will find it, sitting as it does amid a cluster of grassy hills. The land ahead rolls beyond a winding road, before disappearing into the endless sun-sparkled waters of the Great Australian Bight, the Southern Ocean beyond and eventually the Antarctic. There is no sound on that hilltop—save the occasional rustle of a breeze through the idly swaying grasses—and little sign of humanity. Yet it is to that spot that my mind drifts when wanderlust kicks in. Freed of the din of traffic and construction, the press of people and burdens of life, it is to that vantage point I mentally flee to drink in the pure, fresh air and endless vistas, and to bask in the shafts of sunlight which spear through occasionally heavy clouds. I first visited Kangaroo Island in 2006, and though there for less than 24 hours, my heart, my mind and my imagination were stolen for life. In 2011 I ventured back with Outpost for a more thorough exploration and wasn’t disappointed (you can read my account in the October-November 2011 issue). While located just 112 kilometres southwest of Adelaide, the 4,416-square-kilometre island might well be on another planet. Despite being easily reached by a half-hour flight from the South Australia capital (or a two-hour drive and 45-minute ferry ride), Kangaroo Island must be one of the world’s greatest escapes. It may not have palm trees and tiki huts, but it’s most definitely my idea of an island paradise. 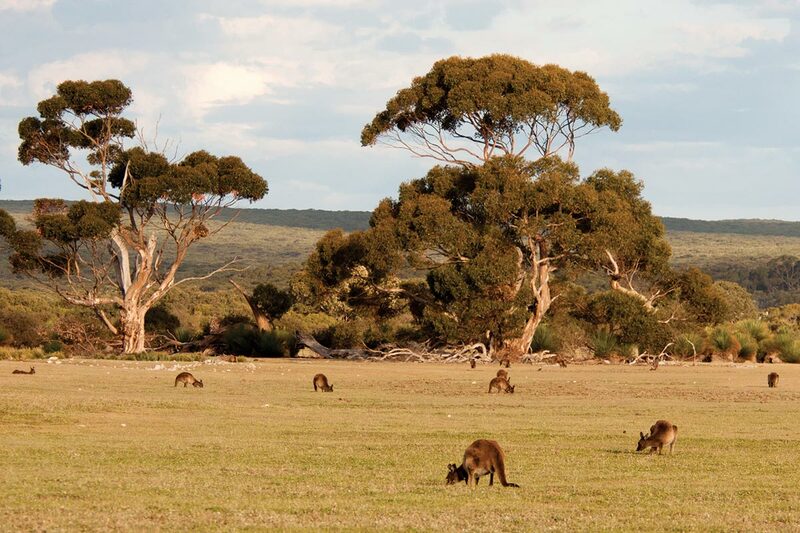 Kangaroo Island offers a complete slice of Australia, barring perhaps a swathe of dusty Outback or an Opera House. It has a wealth of Aboriginal history, swashbuckling tales of early exploration, and the trials, tribulations and ordeals of its first settlers. There are magnificent cliffs, strange rock formations, dense bush, crashing surf, rolling meadows, houses with unlocked doors, classic Aussie billabongs, eucalyptus and gum trees, picture-perfect dunes, empty white-sand beaches, towering 19th-century lighthouses, mysterious caves and the occasional ancient hand-hewn arrowhead lying in the sand. And for the most part, a complete lack of mass tourism. There’s wilderness to explore, hiking to be done, sea-kayaking on offer and pretty decent surfing. Farms offer mouth-watering honey scented with wildflowers; exquisitely fresh lamb; outstanding seafood; decadent all-natural ice creams; concoctions made from succulent local berries; and vineyards that sell salt-kissed wines and local liqueurs. Plus, the warmth and friendliness of the local people. All 4,413 of them! Beaches are filled with lounging sea lions and colonies of fur seals; penguins commuting from the crashing surf to safety beneath the porches of seafront houses; koalas napping in treetops, and clear skies filled with cockatoos and enormous wedge-tailed eagles (wedgies, to the locals!). Goannas strut down quiet roads, echidnas (spiny anteaters, if you prefer!) waddle with intent while rush-hour offers more possums, wallabies and kangaroos than cars. The surrounding waters teem with whales, orcas, dolphins and sharks, while warming early morning tarmac have just enough snakes to make it interesting without making it fearful. It is to Kangaroo Island that my mind races when free, to Kangaroo that my body will always flee, given half a chance.